Grades: 2-5. 8:35 a.m. - 3:05 p.m. Welcome to Banyan Elementary School's website. 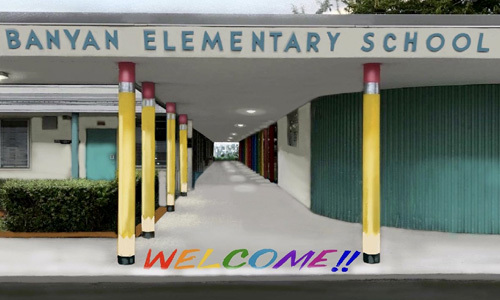 The vision of Banyan Elementary School is to create, through our students, a society that allows for responsibility, justice , and fairness; thus providing its students with opportunities to become cooperative and successful participants in a world of diverse cultures, while pursuing excellence. Each year is a new and exciting challenge for each of us. The administration and staff are enthusiastic and excited about working with our students to provide a learning environment conducive to each child's needs. It is the mission of Banyan Elementary School to develop each child's academic, social, physical, and emotional potential in a wholesome, supportive environment so as to create lifelong learners and contributing citizens in a multi-cultural and changing world. The staff at Banyan Elementary School pledges our efforts to provide the best possible environment for all stakeholders.